"LOG OF THE PRIM MERMAID"
At dinner, all the detainees sat together at tables for six and ate a very good meal. While we were eating, a young officer in uniform came in and spoke to one of the men sitting across from me. His friend, who spoke French, said something to anger the officer who then turned on this fellow, getting up close to his face, shaking his finger, shouting and making terribly evil faces at him. The problem seemed to have something to do with the woman cook, who got between the two men, preventing them from literally fighting it out. This confrontation definitely made me very uneasy. I returned to my room and turned on the radio. I could only find two baseball games in English, the same sports talk-show at three spots on the dial, and Spanish programs. So I listened to some classical music on a Cuban station. It was nine P.M. and too late to take the plane to Miami. 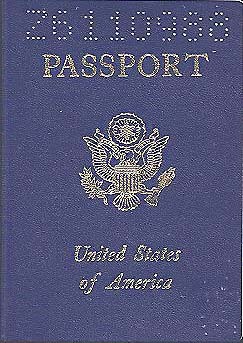 I thought if I got the chance, I'd ask to go to Mexico or Jamaica where I could probably get into the U.S. without a passport. I listened to a soap opera in Spanish but could only understand a few words. One of the other detainees, who seemed to be a trustee, came to my door and offered me a pitcher of ice water. I said, "Muchos gracias", and in English, he responded, "Thank you". There were no windows in my room, but there was an air conditioner, which I set to blow in fresh air. I went to the bathroom down the hall where there was a window, but with bars on the outside. Castro was talking politics on all of the TV channels. I didn't understand him, so I returned to my room where "Fidel", as everyone there called him, was on the radio, also. The TV was on loudly so I heard him in "stereo". Even though his spelling and syntax were poor, it was obvious that some previous occupant of this room had been given a difficult time. It added to my feeling of unease, and getting to sleep, was tough. I woke from a nightmare a 4:00 A.M. The dream was a vivid one. I was still incarcerated in Cuba, and for the life of me, I could not come up with an answer to any of the questions the authorities asked me. I couldn't even recall a single telephone number. We were trying to call Key Wests' Mayor, Captain Tony Tarricino, but kept getting wrong numbers. In my dream I was becoming hysterical. I finally got up from bed at 8:00 AM. Breakfast was only a cup of hot chocolate and Cuban coffee. I gave my coffee to the man who had brought me the ice water the day before. I didn't know how to contact any authorities, so I waited for a while and hoped that they would come down and talk to me. Finally, I was called upstairs and introduced to two Americans from the Swiss Embassy. They tried to take photos of me with an old Polaroid camera, but the film was also old and the pictures didn't turn out. I was told that I could accompany these two rather out of place American diplomats. We drove through Havana to the Swiss Embassy, which was the former U.S. Embassy, and even still had the American eagle emblem on the wall at the entrance. 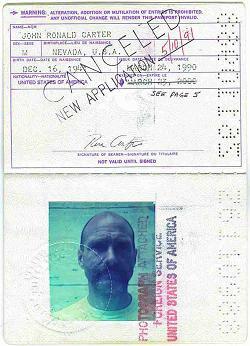 We went into the "American Interest" office, where they succeeded in taking a couple photos, issuing me a passport which was good for two weeks. 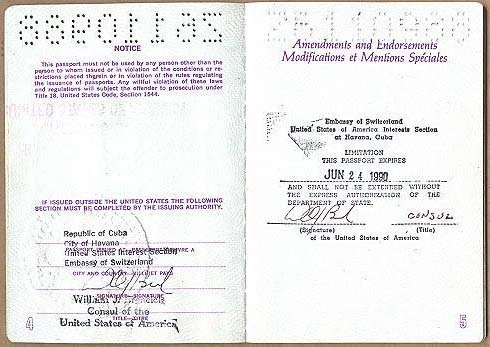 I was told that it was rare to have a US passport issued in Havana, Cuba. As we left the embassy, the Americans pointed out a large propaganda billboard placed near the front of the embassy. It stated: "We will succeed in crushing the imperialists". I had seen many propaganda billboards along the roads, some even set up in rows like "Burma Shave" signs, but this was the only one I had seen in neon. As we drove through town, I occasionally saw a military policeman, standing unarmed on a street corner. Everywhere there were parked military vehicles with no one in them. One thing that astonished me was the presence of vintage, early 1950's American cars. I can't remember when I'd seen so may '52 and '53 Chevies. I spotted one being used as a taxi and a 40's vintage Ford passed us. Motorcycles with side-cars seem to be very popular. The Americans returned me to the "Immigration Hotel", as they referred to it, and I was told that I'd be on the plane to Miami at 9:00 PM. As I entered the building, I saw an officer carrying an automatic weapon, the only one I'd seen since arriving in Cuba. Back downstairs I offered the other detainees a Cuban newspaper I'd gotten at the embassy. I napped after a lunch of fried rice, mashed potatoes, salad, and a bollo. One of my new friends knocked on the door and asked if he could listen to a baseball game on my radio. I guess my room was the only room to have one. Soon there were eight or more people gathered around listening. We spoke now and then, and I drew a picture of the Prim Mermaid and a map showing the trip across the Florida Straits which had landed me in this situation. One man said he'd been incarcerated for nine days, but that he expected he'd be leaving after two more. Another said he had been there only two days. No one seemed at all pleased at being there. An officer came in and exchanged cigarettes (the Cuban "Popular" brand) for American money and soon the room was full of the foulest smelling smoke imaginable. So I left them to listen to the game and went to watch TV. "Fidel" was again talking everyone's ears off so I made the (yakety, yakety, yak) "sign" with my hands and lips and everyone in the rec-room laughed loudly. After I'd done it, rather spontaneously, I was a little afraid I'd stepped out of bounds, but nothing more was ever said about the incident. At 8:00 PM, I bid farewell to my friends and was driven through Havana in a police car to Jose Marti Airport, where I was allowed to make purchases while waiting to board the plane. With American money I bought post cards, T-shirts, Russian vodka, Cuban rum and Havana cigars. A uniformed Immigration police woman helped me force my way through a huge pushing crowd, to get to a small exit door and to the shuttle bus. My bags were never searched. Not in the airport, or, to my knowledge, at any time. The police woman literaly escorted me to the plane door, while two policemen in a car kept a close vigil by the plane. I thanked this woman and asked her to convey my appreciation to her superiors for the respect I'd been shown. 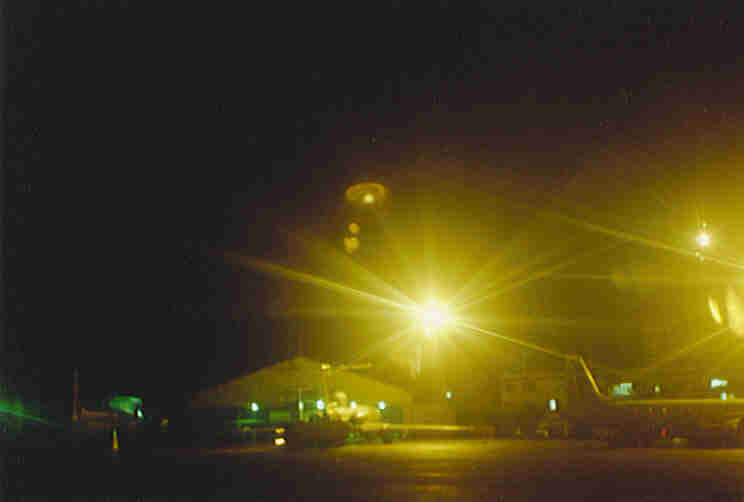 "My photo taken from the plane of Jose Marti Airport"
As the plane left the ground, I had a great view of the lights of Havavna. And at 12:00 midnight, I arrived at Miami International Airport. The entire flight took only half an hour on this Eastern charter, so upon disembarking, I said to one of the attendents, "For $160, I expected a meal". She told me that since the Cubans had to pay $700 for the same flight, most of which went to Castro, I'd gotten a bargin. I was the only American on the plane and went through customs in less than a minute, at a different station than the Cuban passengers, and again, my bags were never checked. While waiting at the bus terminal in Miami, I spoke with the security guard and showed him the Cuban newspaper, dated the previous day, which I'd brought back with me. 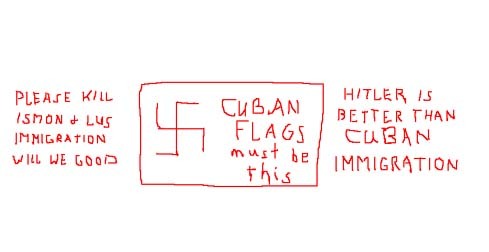 He told me why he had left Cuba. He'd been an officer in the Cuban army when teachers were being shot. His son and daughter are now teachers in Cuba. The gray haired man who relieved him, also a Cuban, smiled when I told him I'd been to Bahia Honda. He said it had been his home. I asked if he smoked cigars and he answered, "yes", as I handed him one of the Havanas. He breathed in deeply as he passed it under his nose, then smiled and laid his hand on my shoulder. His eyes got misty and he walked away to stand alone for a while by the fence. Upon returning to Key West, I discovered many things through mutual friends about the captain of the Prim Mermaid. It was explained to me that he was wanted by the authorities in another state, the local Coast Guard was looking for him relative to operating a vessel while intoxicated, and, to top it off, he'd told people that he didn't like me! I guess he'd only taken me along to help finance his "escape". There were many sailors in Key West, mostly fishermen, who told me of their recent experiences in Cuba. Only one was not a horror story and it sounded very much like mine. Washed onto Cuba by a storm, he was, as I, treated with respect. All the other stories included tales of jail, beatings, "injections", etc. The men who told me about these bad trips also told me of resisting being boarded by the Cuban gun boat crews, using abusive language, and even firing at the Cubans with small arms. Everywhere I went in Cuba I was treated with respect, understanding, and kindness. When I said that I would like to return there as a tourist, I was invited to the 1991 Pan-American Games in Havana. The authorities said I would be welcome, but, I could not come from the US with an American passport. I could only enter from another country, using my International Passport. THE END -- "Log of the Prim Mermaid"